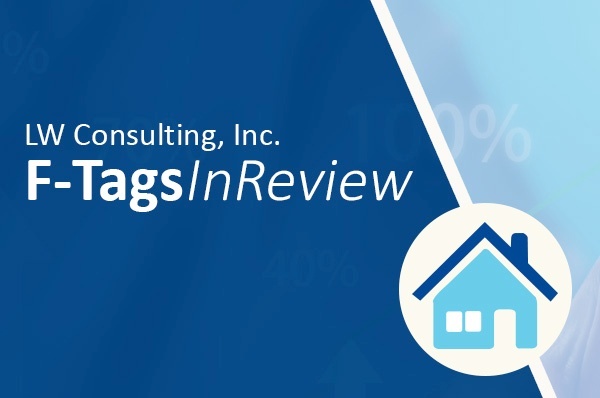 This week's “F-Tags in Review” focuses on F584 which is a combination of seven previous F-Tags. Each of these previous tags correlates to impact the environment in which residents live and have a significant impact on quality of life. the maintenance of comfortable sound levels. The goal of the regulation is to provide residents with an environment that is free from an institutionalized feel. Think of an environment that you would be most comfortable in. Most people would like to have their rooms decorated with pictures and familiar furniture. The same applies for the residents you serve. Those in our care have a right to live in a clean environment where odors and sound are controlled. Burnt bulbs, broken faucets and clogged pipes—along with structural issues—should be addressed immediately. Note that F584 is not limited to residents’ rooms, but to all areas of the community, including the building's exterior. Reducing and/or eliminating overhead announcements and music played through facility speakers. Taking trays out of the food service program so that residents may eat in the same manner as they would within their own home. Reducing the amount audible chair and bed alarms. Residents must have access to closets where they are able to reach clothes on a hanger. There must also be separation between clothes of one resident and clothes of a roommate. The lighting in the room must be appropriate for residents to perform daily activities. During the survey process, surveyors will ask residents if they feel that the facility provides a homelike environment, and whether they have been encouraged to bring in personal items. Surveyors will also ask questions pertaining to the lighting such as: “Do you have adequate lighting to read, and can you see what you are eating?” “Is the lighting too bright?” “Do you have any issues with the cleanliness of your room?” Responses will be noted and will require follow-up. For a full list of commonly cited deficiencies, download our latest F-Tags In Review report. Is your facility in compliance with the new F-Tag requirements? Let LW Consulting, Inc. conduct an operational review to assess your risk of non-compliance. We also provide education, in-service training and mentoring for housekeeping and maintenance personnel.